Hand painted mache' and wood boxes, glassware and knit gifts can be personalized for any event or occasion and are available in many different sizes and shapes. You and I can work together to develop just the right keepsake that will show how much you care. Check out these examples and remember... the gift you want is made to your exact specifications -- that's my specialty! Shadow Box - 'Batman's Secret' Painted background with items added. Shadow Box - 'Finger Lickin' Good' A Praying Mantis at home. Shadow Box - Snacking on fried ants. Shadow Box - 'Alien Farming' A recycled wine box. Painted background with items added. Memory Box - "Donuts!" The pea and gear move inside the clear dome. My take on a snow globe. Memory Box - "Surrender Dorothy!" Inside the clear dome is Dorothy, with a brain, heart and courage. Memory Box - Pizza for a friend. Inside the box is a knit slice of no calorie pepperoni pizza. Beer Glass - A wonderful gift for a Raiders fan. 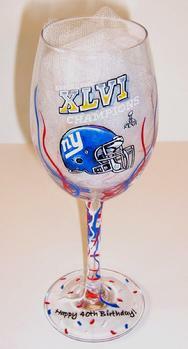 Wine Glass - Happy Birthday to a Giants fan. Beer Glass - Any Miami Dolphins fan would love this glass. Pins - Make a statement with a pin. Hand painted on wood, 1.5" diameter. Knit - 'Orange Chicken' Chinese Take Out. Knit - 'Vito Cornbino' Mob Corn Dog. Knit Food Wraps - 'Purrrito', 'Chicken Wrap', and 'Pig In A Blanket'. Shadow Box - 'Batman's Tryst'... Cat Woman's living room is painted inside a vintage wine box with a Cat Woman figurine in the foreground. Shadow Box - 'Felix and Friends' is painted inside a vintage wine box with a Felix figurine in the foreground. Shadow Box - 'My Name Is Sue'... Hand painted inside a vintage wine box. Darth Vader gets punched. Memory Box - Say it all with one special gift. Memory Box - Girl Power! Shadow Box - A Robby the Robot figure stands on the Forbidden Planet. Painted inside a vintage wood wine box. Wine Box - A wedding gift that's full of memories. On the couple's snowboarding first date, she had to borrow ski clothes that were too big for her. Wine box - Matches the plum color wedding theme with memories of Las Vegas. Canvas - 9" x 12"'Morticia knits. A family member in his knit sweater hangs on the canvas. Memory Box - 'Eat your brussel sprouts!' A knit brussel sprout inside. Memory Box - 'Success is not always what you see.' A smiling knit carrot inside. Memory Box - 'Santa Parties Hard' My version of a snow globe with Santa's bad food choices inside the clear dome. Wine Box - Santa takes a balloon ride over the vineyards. Holiday Gift Box - A snowman friend in the nest. Christmas Ornament - Personalized with names. Christmas Ornament - 'The Scream' Gingerbread man. Mixed Media - A paper White House with a black widow on top says it all. Memory Box - 'Robots Making Donuts' Inside, a knit donut with nuts! Memory Box - A tribute to Bowie. Memory Box - A tribute to Spock.